Today’s market of green cars contains more than thirty models and the number is gradually increasing. Naturally, to be the leader in this segment, automaker should constantly provide upgrades and new vehicles because hybrid and electric cars field certainly speeds up to gain the pace of the gas-powered models. Let’s face it, customers are eager to see new vehicles at all times, so they should not be disappointed. This rule certainly applies to Prius, the legend of the hybrid segment that has been already called the world’s leader by the Japanese automaker. To keep the legend alive, Toyota provided an updated plug-in model. It is called the 2017 Toyota Prius Prime and has a lot to offer to the customers, including more standard features, new exterior design, enhanced mileage, and others. According to the manufacturer, Prime is one of the most best-equipped and technologically advanced Priuses in the history. We have eagerly waited for the New York Auto Show to get a good look at the vehicle and were not frustrated. 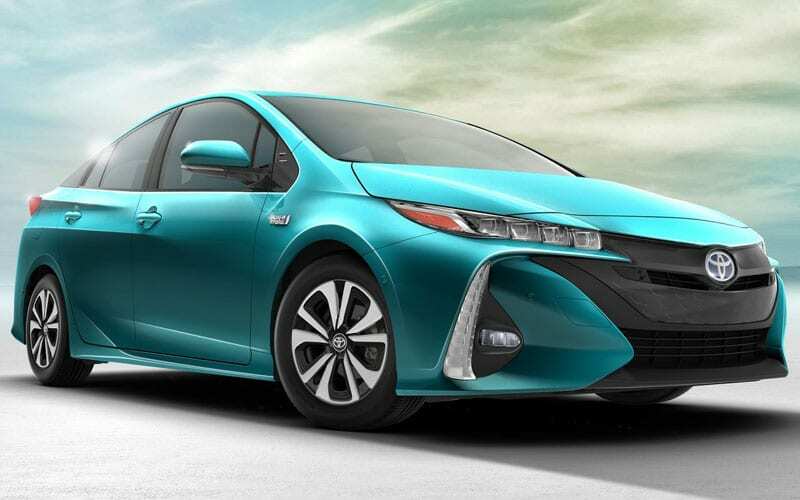 As you probably guessed, exterior of the 2017 Toyota Prius Prime looks very futuristic and screams Prius’ name. The designers were clearly guided by the principles of maximum aerodynamics because of body’s features that attempt to minimize the air resistance. The front of the vehicle also received a remarkable LED illumination: the horizontal headlights are now matched to daytime running lights, and the same has been done with the taillights. According to Toyota, the illumination is the state-of-the-art technology as well, because it significantly reduces the consumption of energy. Car’s profile has a strong appearance that has a little bit aggressive element to it. That’s definitely good news because many reviewers have long labeled Prius design as uninteresting in terms of the exterior. However, the rear has been made in traditional bulbous style, but we’re okay with it because it leaves that unforgettable iconic look. Therefore, whether we like it or not, the automaker decided to go with mostly recognizable exterior that will be praised by the fans of green cars and hated by speed enthusiasts. Did we like it? Well, it certainly looks better, and we surely have to give Japanese manufacturer some credit for following the tradition. 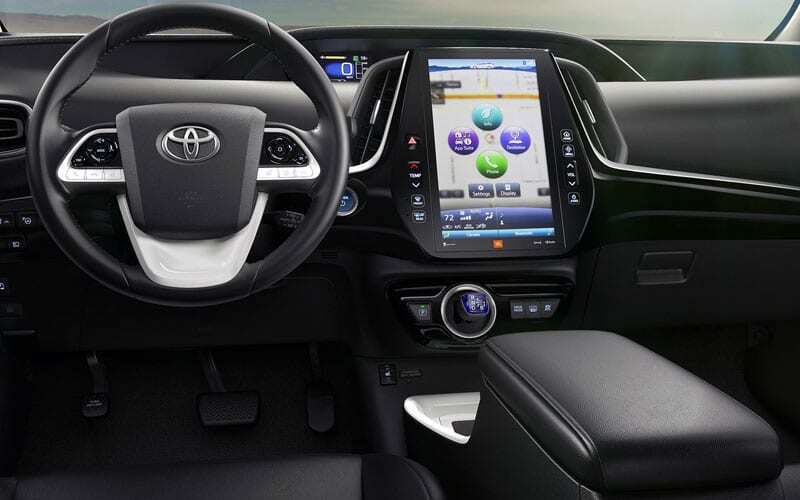 The cabin of the 2017 Toyota Prius Prime reveals that the designers have followed some traditions here as well. Specifically, it offers a significant amount of space for the driver and passengers and has an unmatchable futuristic design. The manufacturer still keeps the room only for four passengers but also has plans to make space for one more, so we have to stay tuned for that. Perhaps the most noticeable element that draws attention right away is a large 11.6-inch infotainment screen with vivid graphics and crisp colors, installed on the center console. Another screen is located right above it to show different information about the vehicle, including drive mode selection and speed. 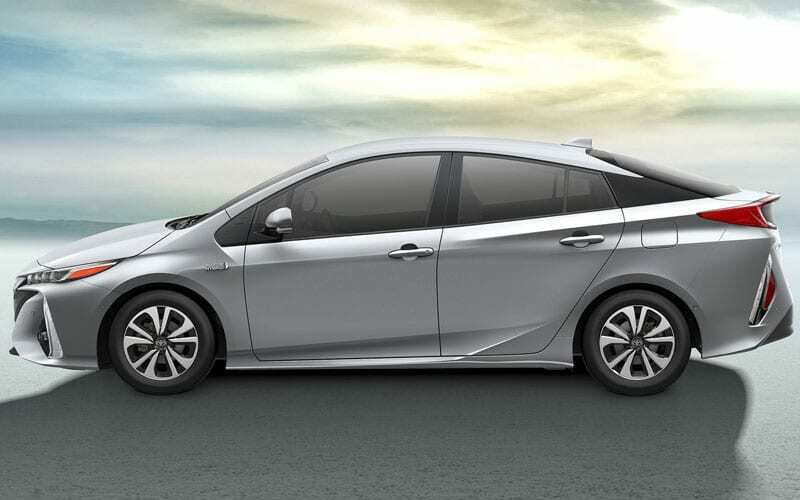 Toyota claims to have solved the problem of excessive noise in the cabin that was experienced by the drivers of previous generation Prius by providing sound-deadening insulated glass for the front doors and windshield. 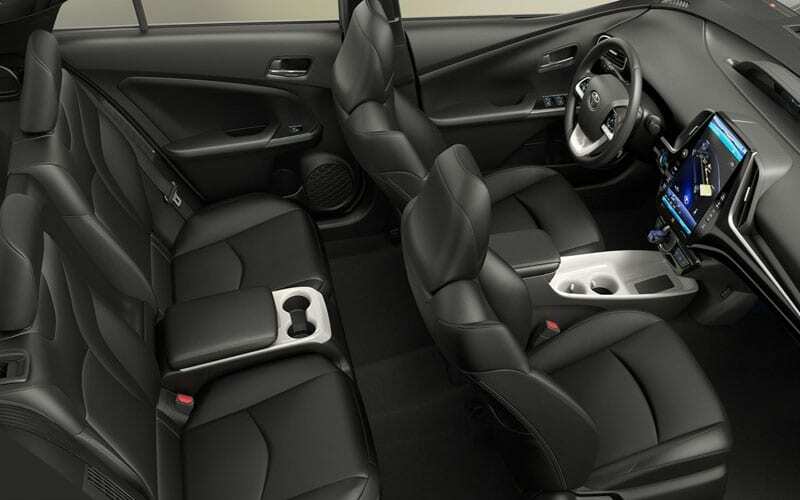 A wide variety of new features in the cabin were added as standard, including a backup camera, automatic climate control, navigation, and heated front seats. Previously, these features were extra and should have been purchased, so this is a good news and Prius fans. 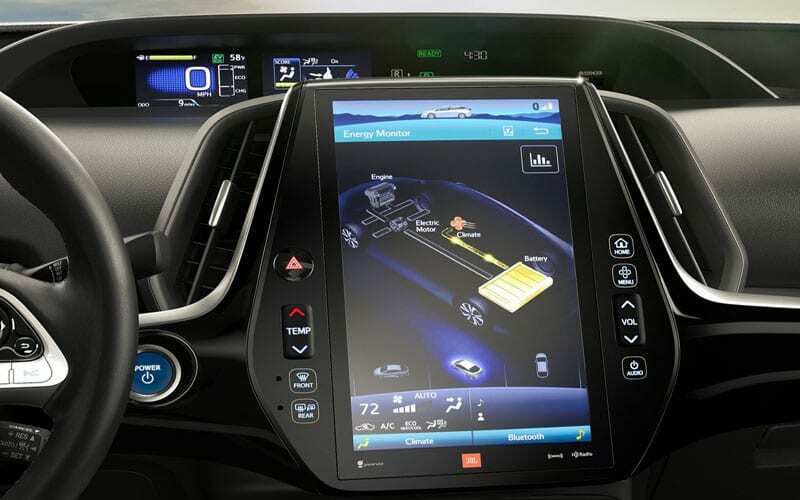 However, the list of great features in the cabin does not end there: the automaker made it easy for owners to control the charging of the battery, locating charging stations, scheduling the refill by providing the remote control app for smartphones. Moreover, the list includes Bluetooth, voice recognition, premium sound system, USB jack, and a wireless charging dock. 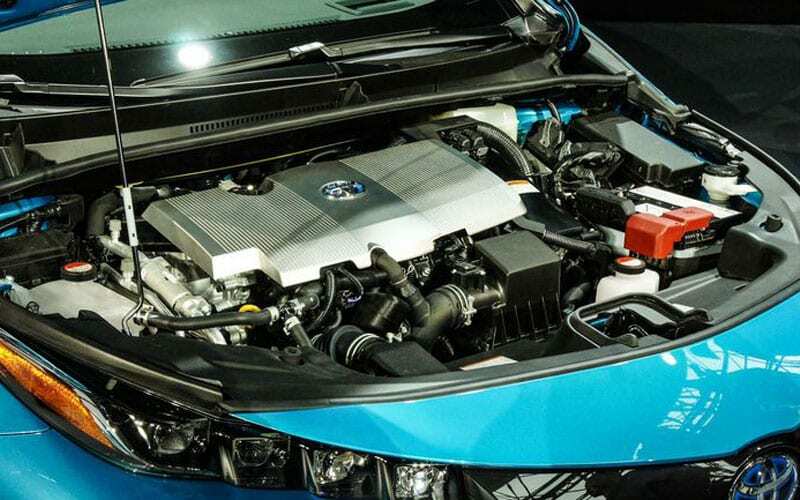 According to the manufacturer, the 2017 Toyota Prius Prime will use the latest Hybrid Synergy Drive technology that allows connecting electric and gas units through a continuously variable transmission (CVT). 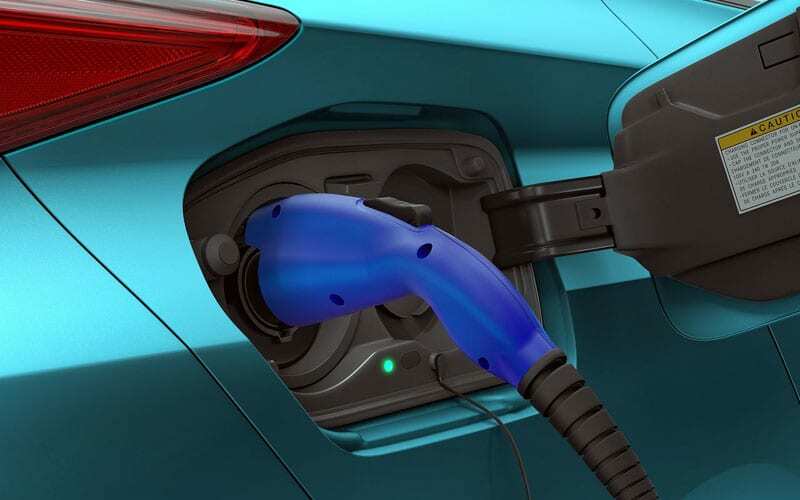 The model’s 8.8-kWh battery can be easily charged from a household socket via a supplied cord, and it requires less than five hours to recharge completely. According to Toyota, the recharge time can be significantly decreased if a 240V socket is used. 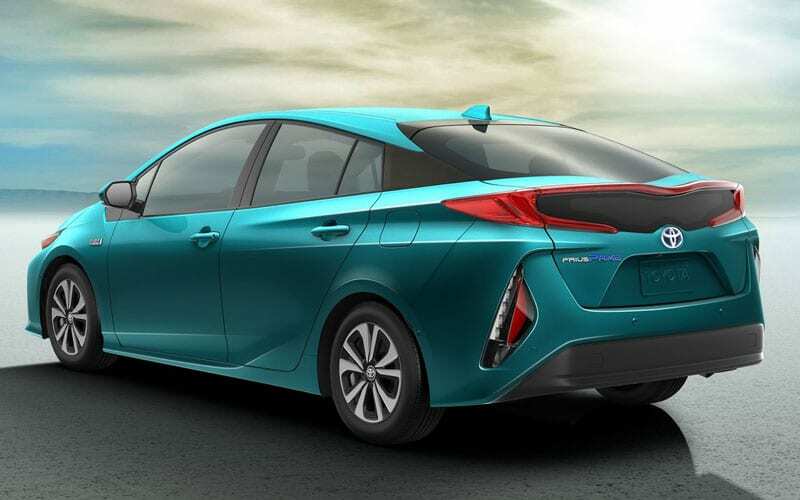 The gasoline unit is the 1.8-liter Atkinson cycle engine that was used in this year’s Prius. We do not mind the inclusion of this engine because of its incredible 40% thermal efficiency that has no close competitors on the today’s green segment. This unmatched performance is delivered by a number of improvements in the engine system, including smaller water pump that allows reaching appropriate operating temperatures in a shorter time. Combined, these engines deliver a solid performance: 121 horsepower and 105 lb-ft of torque. As for the efficiency, it is rated at 120 MPGe, which is about 20% more efficient compared to the previous generation. The range of the electric unit was also increased to 22 miles if the battery is fully charged and the combination with the gasoline engine increased the total range to about 600 miles. That’s impressive. Standard safety features of the 2017 Toyota Prius Prime include eight airbags of various sizes and functions. In addition, the manufacturer provides a special Safety Sense package that features a lot of advanced systems, such as adaptive cruise control, lane departure warning, parking assistant, automatic braking, pedestrian detection, and blind spot monitoring. 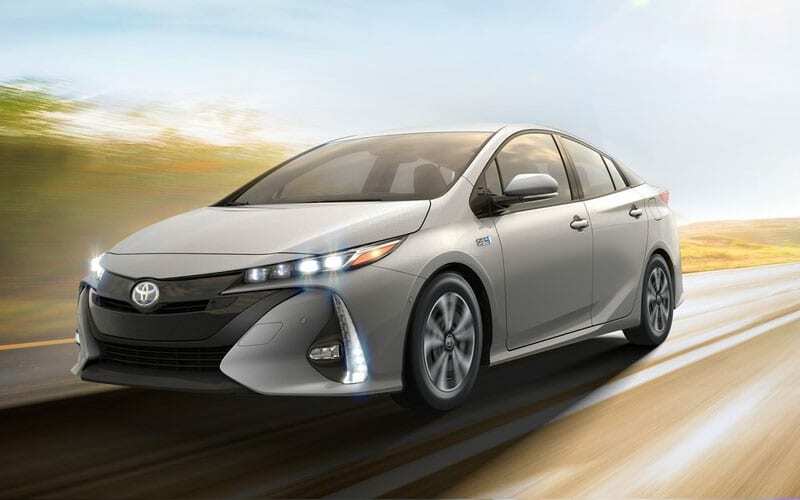 Clearly, Toyota has delivered a great load of safety functions in Prime that deserves praise because if the company intends to remain a leader in the green segment, it should not only focus on reducing emissions. Price is still unavailable, but giving the existing load of features it is safe to assume that it will start at about $30,000. The Prime will go on sale in late 2016. The release of a plug-in model is certainly a good move for Toyota that has not been in this area. This model could change the situation and bring the company some good benefits because it is a great option for the purchase. We believe that Prime will help Toyota to get its share in the green segment despite the fierce competition from Ford and Chevrolet, which is perhaps the main goal of the model.